Florida State has two Heisman Trophy winners in its storied history. Jameis Winston now has the chance to forever place his name alongside ‘Noles greats Charlie Ward and Chris Weinke. 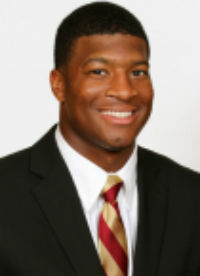 Winston, FSU’s redshirt freshman quarterback, was named one of six finalists for the 2013 Heisman Trophy Monday night. Ward won college football’s top award in 1993, and Weinke won his in 2000. Like his predecessors, Winston has led Florida State to a national-championship game berth before being named a finalist for the Heisman Trophy. The 2013 campaign has been a record-breaking one for Winston. The star-studded ‘Noles have already set the school record for points, yards, touchdowns and are just 28 points shy of setting a new FBS record for most points scored in a season. Winston has been the orchestrator of that offensive prowess, setting the FBS freshman record and ACC overall record for touchdown passes thrown in a season (38). He is also the FBS freshman record holder for yards thrown in a season (3,820) and has a 90.9 QBR that is best in the entire country. Winston is also first in the nation in passer rating at 190.06. Other finalists include Johnny Manziel (Texas A&M), Andre Williams (Boston College), Jordan Lynch (Northern Illinois), Tre Mason (Auburn) and AJ McCarron (Alabama). The winner of the Heisman Trophy will be announced Dec. 14 at 8 p.m. in New York City.